Recent lineage tracing analyses have significantly improved our understanding of immune system development and highlighted the importance of the different hematopoietic waves. The current challenge is to understand whether these waves interact and whether this affects the function of the immune system. Here we report a molecular pathway regulating the immune response and involving the communication between embryonic and larval hematopoietic waves in Drosophila. 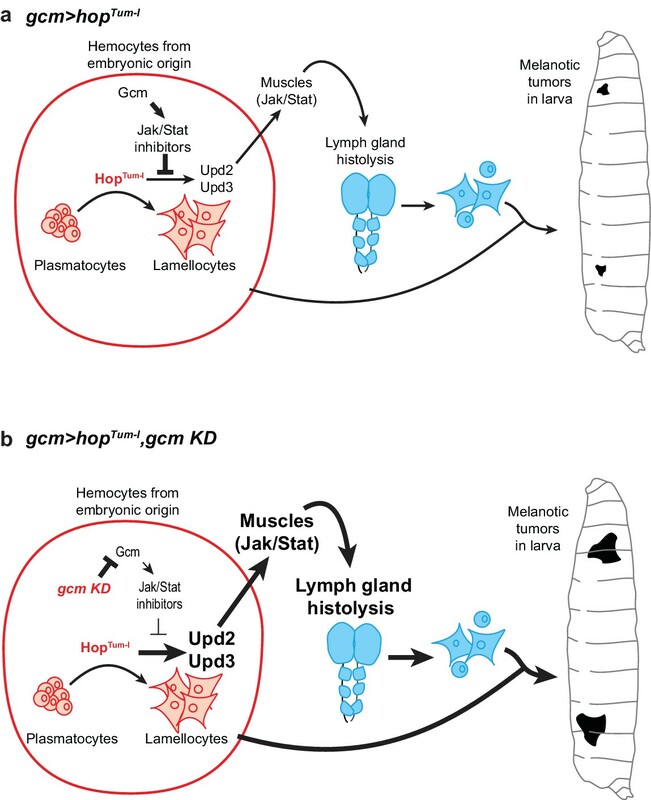 Down-regulating the transcription factor Gcm specific to embryonic hematopoiesis enhances the larval phenotypes induced by over-expressing the pro-inflammatory Jak/Stat pathway or by wasp infestation. Gcm works by modulating the transduction of the Upd cytokines to the site of larval hematopoiesis and hence the response to chronic (Jak/Stat over-expression) and acute (wasp infestation) immune challenges. Thus, homeostatic interactions control the function of the immune system in physiology and pathology. Our data also indicate that a transiently expressed developmental pathway has a long-lasting effect on the immune response. In vertebrates, immune cells are generated from hematopoietic waves occurring at distinct places and times. The first wave occurs in the yolk sac and generates primitive erythrocytes and macrophages (Baron et al., 2012; Perdiguero and Geissmann, 2016). Later waves occur at several time points from embryonic to adult stages and produce all the blood lineages of the adult organism (Cumano and Godin, 2007; Orkin and Zon, 2008). Recent advances in lineage tracing approaches have made it possible to unambiguously assess the origin of immune cells and have shown that the immune cells from distinct hematopoietic waves coexist (Perdiguero and Geissmann, 2016; Ginhoux et al., 2010; Gomez Perdiguero et al., 2015; Hoeffel et al., 2015; Ghosh et al., 2015). Despite these great advances, however, the precise contribution of each wave to the immune response is still poorly understood (Ditadi et al., 2017). Moreover, cells from the early wave could help those from later mounting an appropriate response, calling for homeostatic interactions in physiological and pathological conditions. In Drosophila melanogaster and Manduca sexta, a first hematopoietic wave occurs in the procephalic mesoderm during the embryonic life (Nardi et al., 2003; Gold and Brückner, 2014). Pluripotent precursors called prohemocytes generate plasmatocytes and crystal cells that constitute the only immune cells until the larval stage. The crystal cells represent 5% of the hemocytes, they remain close to the proventriculus and play role in melanization; the plasmatocytes represent 95% of the hemocytes and are professional macrophages that populate the whole animal. During the larval life, the plasmatocytes shuttle between the hemolymph (circulating hemocytes) and a subepithelium compartment they transiently attach to (resident or sessile hemocytes) (Gold and Brückner, 2014; Stofanko et al., 2008). The second wave occurs at the larval stage in the lymph gland (Nardi et al., 2003; Grigorian and Hartenstein, 2013), which starts forming during embryogenesis and keeps growing until the onset of metamorphosis, when it disintegrates to release plasmatocytes and crystal cells into the organism. Upon an acute challenge such as wasp infestation, the larva mounts a complex immune response and similar phenotypes are observed in genetic backgrounds in which pro-inflammatory pathways such as Jak/Stat are constitutively activated, a condition that could be considered as analogous to chronic inflammation (Luo et al., 1995; Harrison et al., 1995). Typically, the resident hemocytes leave the sessile compartment and enter in circulation, hemocytes proliferate and plasmatocytes transform into lamellocytes to form cell aggregates called ‘melanotic tumors’ that encapsulate the parasite wasp egg, the lymph gland undergoes premature histolysis and hemocyte release (Letourneau et al., 2016). The sequence of these events and the contribution of embryonic hematopoiesis to this immune response are not clear. We here describe a link in the regulation of inflammation and its threshold of response between events that, in the past, have been described as independent events separated in time and location. We show that the embryonic wave is necessary to mount an adequate immune response upon signaling to the larval wave and that the only known transcription factor specific of the embryonic hemocytes, Glide/Gcm (Gcm throughout the manuscript) (Bernardoni et al., 1997; Lebestky et al., 2000; Alfonso and Jones, 2002; Bataillé et al., 2005; Avet-Rochex et al., 2010) is a major player in this process. Gcm induces the expression of Jak/Stat inhibitors and in so doing inhibits the production of Jak/Stat dependent pro-inflammatory cytokines that eventually control the Jak/Stat pathway in the muscle. As a consequence, the second hematopoietic wave occurring in the lymph gland is affected as well. Thus, the embryonic hematopoietic wave contributes to the inflammatory response and modulates larval hematopoiesis, demonstrating the importance of interactions between embryonic hemocytes and the lymph gland during the inflammatory response. Finally, we highlight the long-lasting effect of a transcription factor expressed early and transiently during hematopoiesis. Our first step was to investigate the impact of the embryonic plasmatocytes on systemic inflammation. The Jak/Stat pathway is a major transducer of the inflammatory signal upon immune challenge. Its constitutive activation due to the mutation hopscotchTum-l (hopTum-l) (Luo et al., 1995) in the Jak kinase induces the formation of melanotic tumors in larvae, a strong increase in the number of hemocytes, the production of lamellocytes (Figure 1a–e) and precocious lymph gland histolysis (Luo et al., 1995; Harrison et al., 1995). We crossed hopTum-l flies with flies in which we modulated the expression of the Gcm transcription factor. Gcm is expressed early and transiently in the first hematopoietic wave, from embryonic stage 5 to stage 11, but no longer in the mature plasmatocytes (Bernardoni et al., 1997; Alfonso and Jones, 2002; Evans et al., 2003), nor is it expressed during the larval hematopoietic wave (Figure 1—figure supplement 1) (Bernardoni et al., 1997; Lebestky et al., 2000; Alfonso and Jones, 2002; Bataillé et al., 2005; Avet-Rochex et al., 2010; Zaidman-Rémy et al., 2012). Homozygous gcm null embryos die before hatching and show a slightly reduced number of plasmatocytes (Bataillé et al., 2005) with concomitant increase in crystal cell number (Bataillé et al., 2005) (Figure 1—figure supplement 2a–e), however downregulating Gcm expression with the UAS-gcmRNAi transgenic line (crossed with the gcmGal4 or gcm> line (gcm> gcm KD) (Gupta et al., 2016) (Figure 1—figure supplement 3a,b) induces a milder phenotype: the animals are viable, the number of hemocytes and that of crystal cells is similar to that of control animals (Figure 1d, Figure 1—figure supplement 3c–h). Interestingly, gcm KD larvae contain no melanotic tumors and very rare lamellocytes (Figure 1b,d, Figure 1—figure supplement 4a–c’). Accordingly, gcm KD hemocytes express most plasmatocyte and few lamellocyte markers (Figure 1f). Gcm hinders Jak/Stat-mediated melanotic tumor formation. (a) Third instar larvae of the indicated genotypes (Note that all the detailed genotypes are in the Supplementary Methods, Fly strains and genetics section). White arrowheads indicate the melanotic tumors. (b) Penetrance of melanotic tumors (50). (c) Phenotype expressivity assessed as tumor size (n > 40). (d) Total number of circulating hemocytes and lamellocyte contribution (n = 3, using 10 larvae/replicate). (e) Hemocytes (red) and tumors (black) in third instar larvae of the mentioned genotypes. Assessment in terms of tumor penetrance, size and number of tumors/larva, number of circulating hemocytes and percentage of lamellocytes (n = 3, using 10 larvae/replicate). In all figures, *p<0.00.5, **p<0.01; ***p<0.001, ns: not significant; scale bar: 50 µm unless otherwise specified. All the P values shown in this and in the following figures are in Figure 1—source data 1. (f) Relative expression levels of plasmatocyte and lamellocyte markers in larval hemocytes gcm> gcm KD compared to gcm> , measured by qPCR. The data are normalized to two housekeeping genes and then the ratio (gcm> gcm KD/gcm) is plotted (n = 4). The error bars represent the sum of the s.e.m. of gcm> gcm KD and gcm> . Combining gcm KD with hopTum-l triggers much more severe defects than those shown by hopTum-l animals: the penetrance of the tumors increases from 36% to 85% (% of larvae carrying the tumors, Figure 1b,e), the tumors are bigger (Figure 1c,e, Figure 1—figure supplement 4d) and the larvae produce more lamellocytes (Figure 1d,e). In addition, animals in which the Jak/Stat pathway is constantly active and express Gcm at low levels have reduced viability, with fewer larvae hatching as compared to control animals (i.e. animals that only express one of the two molecular defects). An exacerbated tumor phenotype is also observed upon crossing gcm KD flies with a gcmGal4 driver inactive in glia (repoGal80,gcm> or gcm(hemo)> ), the other main territory of Gcm expression, or with independent embryonic-specific hemocyte drivers (srp(hemo)> and sn> ) or upon using the gcm26 null mutation in heterozygous conditions (Figure 1—figure supplement 4e). Thus, the expression of the Gcm transcription factor in the primitive hemocytes modulates the inflammatory response induced by the constitutive activation of the Jak/Stat pathway. Gcm plays an important role as its over-expression (gcm Gain of Function or GOF) rescues the hopTum-l phenotype as well as that of hopTum-l;gcm KD animals (Figure 1b). Interestingly, the number of circulating hemocytes is 5.5-fold higher in hopTum-l compared to wild-type animals, but the further increase observed in hopTum-l;gcm KD animals is incremental (1.1-fold), mostly due to an increase of lamellocytes’ number (Figure 1d,e). The hemocyte phenotype predicts that Gcm inhibits the Jak/Stat pathway. Since the activation of the pathway leads to the phosphorylation and to the nuclear translocation of the Stat transcription factor, we first transfected S2 Drosophila cells with a Gcm and/or with a HopTum-l expression vector and validated this prediction in vitro. Gcm represses the nuclear localization of Stat induced by hopTum-l (Figure 2a–c’’’, Figure 1—figure supplement 4f). Next, we investigated the molecular mechanisms by which Gcm could affect inflammatory response. A genome-wide DamID screen identifying the direct targets of Gcm highlighted several negative regulators of that pathway (Cattenoz et al., 2016) and we selected three major Jak/Stat inhibitors based on their role in hematopoiesis: Ptp61F, Socs36E and Socs44A (Müller et al., 2005) (Figure 2d, Figure 1—figure supplement 4g–i). Ptp61F acts by de-phosphorylating Hop, the only Jak present in flies, and the transcription factor Stat92E (Müller et al., 2005; Baeg et al., 2005; Villarino et al., 2017). Socs36E and Socs44A belong to the suppressor of cytokine signaling family that suppresses Jak/Stat activation by competing with Stat for binding to the Jak catalytic domain (Naka et al., 1997; Yasukawa et al., 1999). Transfecting S2 Drosophila cells with a Gcm expression vector increases the endogenous levels of Ptp61F, Socs36E and Socs44A transcripts (Figure 2e). In addition, gcm KD embryos express these genes at low levels, validating Gcm as a regulator of the three genes, likely at the transcriptional level (Figure 2f). Gcm induces the expression of Jak/Stat inhibitors and hinders Jak/Stat-mediated melanotic tumor formation. (a–c) Immunolabelling of S2 cells transfected with pPac-gal4 and pUAS-RFP (Control, (a), or pPac-gal4, pUAS-RFP and pUAS- hopTum-l (hopTum-l GOF, (b), or pPac-gal4, pUAS-RFP, pUAS- hopTum-l and pPac-gcm (hopTum-l GOF, gcm GOF, (c) and labelled for DAPI (blue), RFP (red) and Stat92E (gray). (a,b,c) show the merge of the three channels, (a’,b’,c’) show RFP alone, (a’’,b’’,c’’) show Stat92E alone and (a’’’,b’’’,c’’’) show DAPI. Arrowheads indicate transfected S2 cells. Scale bar: 20 µm. The percentage of cells presenting nuclear Stat92E is displayed in Figure 1—figure supplement 4f. (d) Jak/Stat pathway: inhibitors of the pathway that are regulated by Gcm are in red. (e,f) Relative expression levels of Jak/Stat inhibitors in S2 cells transfected with a pPac-gcm expression plasmid (three independent assays) (e) and in embryo gcm> gcm KD (f). In both cases, the data are relative to the levels in controls as described in Figure 1f. (g) Penetrance of melanotic tumors (n > 50). (h) Relative expression levels of Jak/Stat downstream targets (apt (Starz-Gaiano et al., 2008), CG1572 (Bina et al., 2010), CG13559 (Bina et al., 2010), Galphaf (Gα73b) (Bina et al., 2010; Bausek and Zeidler, 2014) and slbo [Silver and Montell, 2001]) in hemocytes from stage 16 embryo srp(hemo)> gcm GOF. The data are relative to the levels in controls as described in Figure 1f. Since Gcm is specifically expressed in the embryonic hemocytes, we assessed whether inhibiting the Jak/Stat pathway only in those cells affects the immune response. hopTum-l animals in which the expression of any of the three inhibitors is specifically silenced in embryonic hemocytes (gcm> ) show a strong enhancement of the tumor penetrance (> 90%, Figure 2g). 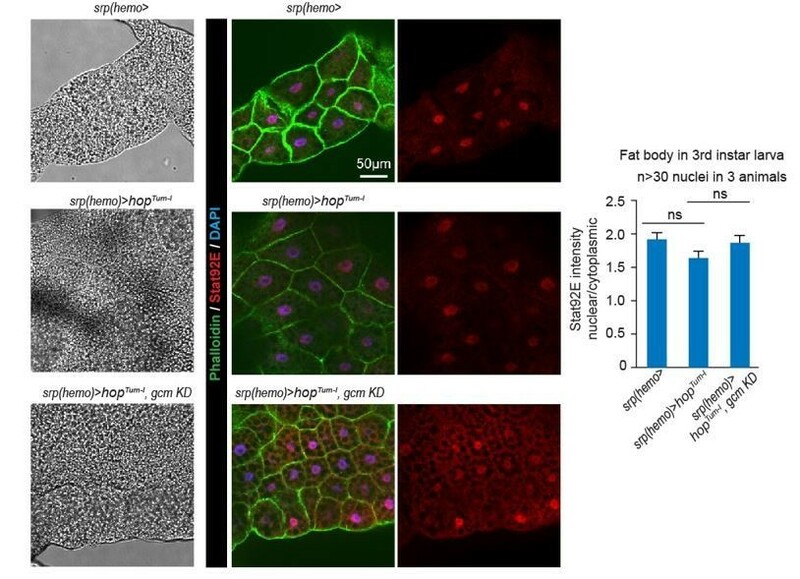 Accordingly, the over-expression of Ptp61F in embryonic hemocytes rescues the hopTum-l phenotype and the exacerbated phenotype observed in the hopTum-l/+;gcm KD larvae (Figure 2g). To assess the impact of Gcm on the Jak/Stat pathway, we analyzed the levels of expression of down-stream targets of Stat92E upon gcm GOF in hemocytes from stage 16 embryos. Several targets of Stat92E were previously described in S2 cells and in hemocytes: apt (Starz-Gaiano et al., 2008), CG1572 (Bina et al., 2010), CG13559 (Bina et al., 2010), Galphaf (Gα73b) (Bina et al., 2010; Bausek and Zeidler, 2014) and slbo (Silver and Montell, 2001). The over-expression of Gcm significantly reduces the levels of expression of these genes (Figure 2h), suggesting that Gcm inhibits the Jak/Stat pathway upon inducing the expression of the inhibitors Ptp61F, Socs36E and Socs44A. Finally, and most strikingly, Gcm affects the Jak/Stat-mediated lymph gland phenotype (Figure 3). The penetrance of lymph glands histolyzed at wandering L3 and the presence of lamellocytes (L4 marker in green) observed in hopTum-l/+larvae are rescued in hopTum-l/+larvae in which Gcm is over-expressed (hopTum-l/+;gcm GOF), while they are enhanced in hopTum-l/+;gcm KD larvae. Because the penetrance of the hopTum-l/+phenotype is already high in Wandering L3 (~112 hr after egg laying (hAEL)), we hypothesized that down-regulating Gcm might induce a stronger defect at an earlier stage. The difference in lymph gland histolysis between hopTum-l/+and in hopTum-l/+;gcm KD larvae is indeed much more significant in Late L3 larvae (~96 hAEL): 46.7% hopTum-l/+larvae and 80.0% hopTum-l/+;gcm KD larvae display lymph gland histolysis (Figure 3g–k). Thus, silencing Gcm accelerates the lymph gland defects, highlighting the interaction between the two hematopoietic waves and revealing the embryonic transcription factor Gcm as an important player in the process. Embryonic hemocytes signal to the lymph gland. (a) Embryonic hemocytes (red) in early and late embryos as well as in a third instar larva. The lymph gland (blue) histolyzes at the larva to pupa transition. (b) Number and percentage of lymph glands showing histolysis and lamellocyte labelling (L4 marker, green) at wandering L3 stage, DAPI is in blue. (c–f) Lymph glands are indicated by hatched lines. (c) Control lymph gland (gcm> ): I° and II° indicate primary and secondary lobes, respectively. (d,e) show hypertrophic glands, lack of lobes and L4 expression. (f) rescue of the phenotype. (g–j) Bright-field images of lymph glands of the indicated genotypes (h–j) from Late L3 larva (~96 hAEL) as indicated in (g). I° and II° indicate primary and secondary lobes, respectively. Note that the lymph glands are partially histolyzed in hopTum-l/+;srp(hemo)> (i) and hopTum-l/+;srp(hemo)> gcm KD (j) animals. (k) Number and percentage of lymph glands showing histolysis at Late L3 stage (~96 hAEL). In sum, Gcm subverts the inflammatory response due to constitutive activation of Jak/Stat by inducing the expression of inhibitors of this pathway. We then asked how the embryonic hemocytes signal to the lymph gland. Prime candidates are the pro-inflammatory cytokines of the Upd family since their expression is induced in cells of both hematopoietic waves by wasp infestation (11‐fold for Upd2 and 38‐fold for Upd3 [Yang et al., 2015]) or by septic injury (Yang et al., 2015; Agaisse et al., 2003) and their mutations prevent the encapsulation of the wasp egg by the fly hemocytes (Makki et al., 2010). hopTum-l animals that are heterozygous for upd2 and upd3 display a reduced penetrance of the melanotic tumor phenotype (Figure 4—figure supplement 1a). Moreover, specific Upd2 or Upd3 over-expression in the embryonic hemocytes (gcm> upd2 GOF or upd3 GOF) is sufficient to induce lymph gland precocious histolysis as well as melanotic tumor formation (Figure 4a,d). Thus, cytokine expression solely in the embryonic hemocytes is sufficient to trigger an inflammatory response. Accordingly, conditional down-regulation of upd2 or upd3 (gcm> upd2 or upd3 KD) in hopTum-l rescues the lymph gland phenotypes induced by the hopTum-l mutation (precocious histolysis and presence of lamellocytes, Figure 4a–c). Embryonic hemocytes signal through Upd2 and Upd3. (a) Lymph gland phenotypes. (b,c) Lymph gland immunolabelling as in Figure 3c–f. (d) Tumor penetrance. (e–f) Relative expression levels of upd2 and upd3 in hemocytes from wandering L3 larvae of the mentioned genotypes. upd2 and upd3 expression levels increase in gcmgcm KD (e), first two columns from the left in e) and even further in gcm> upd2/3 GOF third instar larval hemocytes (e’), column three in (f). Note the different scale between (e) and (e’). (g) upd2 and upd3 expression levels in S2 cells upon transfection with pPac-gcm or pUAS-hopTum-l expression vectors, compared to control levels shown by the dashed line (transfection of an empty expression vector) (n > 5). (h) Tumor penetrance in third instar female larvae. (i) Schematic representation of Gcm contribution to Upd2 and Upd3 production from embryonic hemocytes. We next asked whether the inhibitory role of Gcm on the Jak/Stat pathway involves Upd2 and/or Upd3. Gcm inhibits the expression of upd2 and upd3, as their transcript levels increase upon silencing Gcm in hemocytes (Figure 4e–f). In addition, transfecting a Gcm expression vector lowers the expression of the two cytokines in S2 cells (Figure 4g). Most importantly, Upd2 and Upd3 are epistatic to Gcm in vivo since down-regulating their expression in hopTum-l and even in hopTum-l/+;gcm> gcm KD animals almost abolishes the formation of tumors (Figure 4h). Thus, Gcm suppresses the production of pro-inflammatory cytokines in the embryonic hemocytes. Of note, the tumor phenotype is induced by Upd2 or Upd3 over-expression but not by Gcm silencing, suggesting that threshold levels of the inflammatory pathway may be required for the melanotic tumors to form. Accordingly, the number of circulating hemocytes is higher in larvae over-expressing Upd2 or Upd3 compared to those observed in gcm KD animals (Figure 4—figure supplement 1e), and so are the levels of the cytokine transcripts (Figure 4e–f in the larvae; Figure 4—figure supplement 1b,b’ in the embryos). Finally, silencing Gcm in animals that over-express either cytokine has a moderate effect on the number of circulating hemocytes, further supporting the view that Gcm does not act as an anti-proliferative factor (Figure 4—figure supplement 1e). Next, we asked how Gcm, Upd2 and Upd3 are connected. Since Upds are the ligands of the Jak/Stat pathway, which is inhibited by Gcm, we hypothesized that their expression also depends on Jak/Stat signaling. Transfecting S2 cells with the HopTum-l expression vector strongly induces the expression of upd2 and upd3 (Figure 4g) and these two loci contain STAT binding sites (Figure 4—figure supplement 1c,d), calling for a direct role of the Jak/Stat pathway in inducing the expression of these two pro-inflammatory cytokines. To summarize, Gcm suppresses the Jak/Stat pathway in the primitive wave, thus reducing expression of cytokines Upd2 and Upd3 that can act non-autonomously and signal to the lymph gland. Based on the above results, we hypothesized that the constitutive activation of the Jak/Stat pathway within the first hematopoietic wave is sufficient to trigger tumor formation/lymph gland defects. Indeed, larvae carrying the UAS-hopTum-l transgene and driver<strike>s</strike> specific to the embryonic hemocytes display tumors, abnormal hematopoiesis and precocious lymph gland histolysis (Figure 5a–c third column, Figure 5—figure supplement 1a–f). 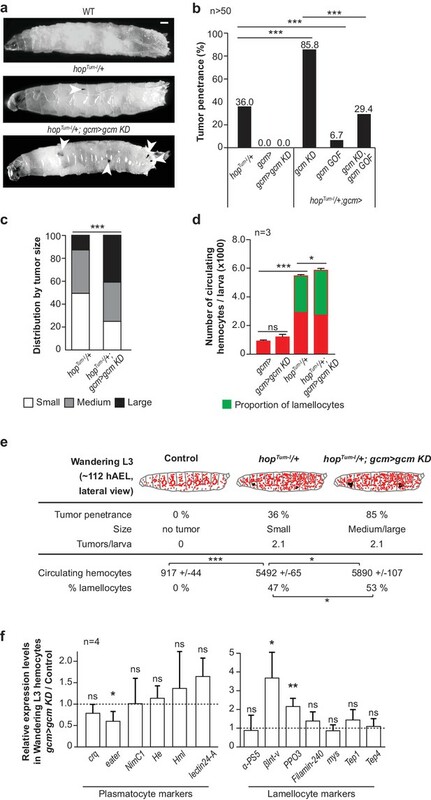 Moreover, silencing the Gcm target and Jak/Stat inhibitor Ptp61F in the embryonic hemocytes also triggers tumor formation (3.1% of tumors are detected in gcm> Ptp61F KD, n = 128 compared to wild type 0%, n = 182, Khi² p=0.0164). Inflammatory response upon systemic and conditional Jak/Stat activation. (a) Tumor penetrance, phenotype expressivity assessed as number of tumors/larva and tumor size of control animals (gcm> ), systemic hopTum-l, conditional hopTum-l (gcm> UAS-hopTum-l) and conditional hopTum-l,gcm KD (gcm(hemo)> gcm KD,UAS-hopTum-l). The distribution of the tumor size is detailed in Figure 5—figure supplement 1b. (b) Precocious lymph gland histolysis and lamellocyte labelling, note the 100% histolysis in conditional hopTum-l,gcm KD. (c) Total number of hemocytes (circulating +sessile), number of circulating hemocytes and number of sessile hemocytes in systemic and conditional hopTum-l mutations as compared to controls. n = 3, the numbers in gray indicate s.e.m. Following this, we assessed whether activating the Jak/Stat pathway systemically or only in the embryonic hemocytes (which we will refer to as conditional activation, for the sake of simplicity) produce comparable responses. The penetrance of the tumors is similar (Figure 5a third and fourth columns), however, the overall phenotype is stronger in larvae that express hopTum-l systemically than in larvae that express hopTum-l conditionally: the tumors are more numerous and larger, moreover, 88.8% of the lymph glands are histolyzed and contain lamellocytes (vs. 28% in UAS-hopTum-l lymph glands, which contain no lamellocytes) (Figure 5a,b third and fourth columns). To further characterize the role of Jak/Stat activation during the first wave, we analyzed both resident and circulating hemocyte populations. Their total numbers are significantly higher upon systemic Jak/Stat activation (7214 hemocytes in systemic hopTum-l, 5689 hemocytes in conditional hopTum-l, p=0.0002, Figure 5c third and fourth columns) and the number of dividing cells tends to be higher as well (14.8% vs. 5.1% upon conditional activation, p=0.178, Figure 5—figure supplement 1c). Finally, we analyzed the resident and the circulating populations separately, as the inflammatory response is known to trigger hemocyte mobilization from the sessile compartment (Márkus et al., 2009; Zettervall et al., 2004). 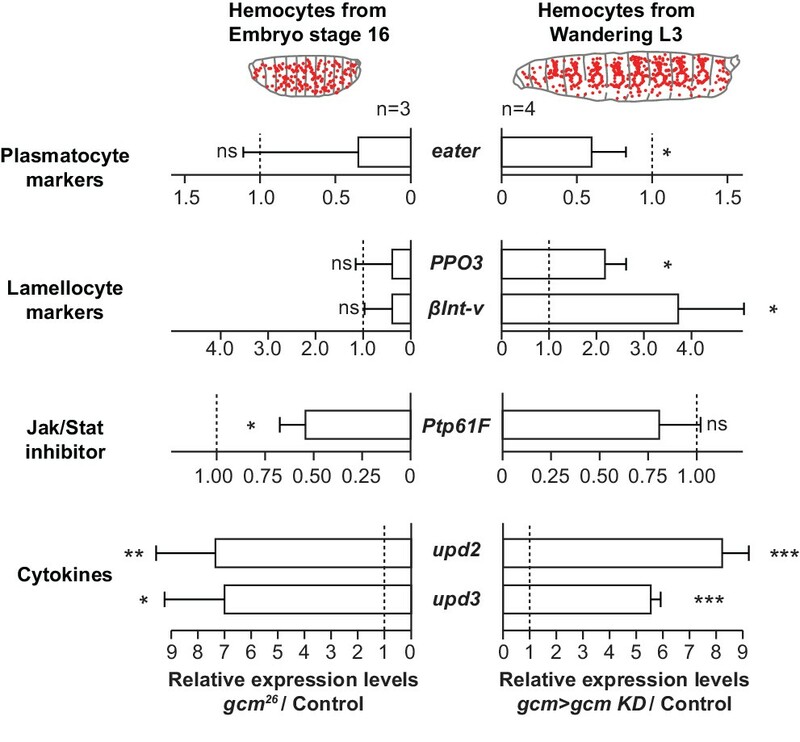 Conditional and systemic activation of the Jak/Stat pathway induce lamellocyte markers in hemocytes in both compartments (Figure 5—figure supplement 1d–f). However, with the systemic mutation, we observe a depletion of hemocytes from the resident compartment and an increase of the hemocytes in circulation (Figure 5c third and fourth column), which indicates abnormal mobilization (Márkus et al., 2009; Zettervall et al., 2004). This does not occur upon Jak/Stat conditional activation in the embryonic hemocytes (Figure 5c third column). In addition, the percentage of resident lamellocytes and the rate of proliferation tend to be higher upon systemic activation (Figure 5—figure supplement 1c,f). In sum, systemic Jak/Stat activation affects the resident compartment more than conditional activation (fewer cells, mostly lamellocytes), likely due to the contribution of the Jak/Stat pathway in additional tissues. Jak/Stat activation in the somatic muscles, which is known to control the inflammatory response upon wasp infestation (Yang et al., 2015), does not seem to account for the different phenotypes observed in the sessile compartment as conditional HopTum-l expression also activates the Jak/Stat pathway in the somatic muscles, as does systemic activation (measured by the 10xStat92E-GFP reporter, Figure 5—figure supplement 1g–i). In line with this, conditional HopTum-l expression triggers increased levels of the protein accompanied by discrete accumulation in the muscle nuclei (Figure 6a–b’, d). As predicted, these animals display high levels of expression of the cytokines Upd2/3 in the hemocytes (Figure 5—figure supplement 1j,k) (Yang et al., 2015). Jak/Stat activation in the embryonic hemocytes activates the Jak/Stat pathway in Wandering L3 muscles. (a–c) Muscle immunolabelling in Wandering larvae of the indicated genotypes. The Phalloidin labelling (in green) highlights the striated muscle fibers rich in actin filament, Stat92E is in red and DAPI in blue. (a,b,c) show the merge of the three channels, (a’,b’,c’) show Stat92E alone. Scale bar: 50 µm. Arrowheads indicate nuclei in the muscles. (d,e) Box-plots representing the distribution of Stat92E intensity (d) and the ratio nuclear/cytoplasmic Stat92E (e) in Wandering L3 muscles of the indicated genotypes. Stat92E intensity was quantified in more than 20 muscles in three animals and the ratio nuclear/cytoplasmic Stat92E was measured in more than 30 nuclei in three animals for each genotype. From bottom to top, the boxes represent the 5% percentile, the first quartile, the median, the third quartile and the 95% percentile. P-values were measured using student test after variance analysis. Since Jak/Stat activation in the embryonic hemocytes triggers defects in the immune system, the phenotypes, we asked whether silencing Gcm aggravates those defects. In sum, Jak/Stat activation in the first hematopoietic wave triggers an inflammatory response and this response is enhanced in gcm KD animals. We next asked whether Gcm modulates the response to infestation by the wasp L. boulardi, which constitutes a more physiological challenge as compared to the chronic challenge induced by a genetically mutant background. Since the immune response to wasp infestation is highly dependent to the conditions applied (Letourneau et al., 2016), we first established infestation parameters that trigger comparable fly responses (see Materials and methods section). Our experimental design was adjusted empirically to maximize the number of Drosophila larvae containing only one wasp egg. Following this, we assessed the impact of Gcm on the overall immune response induced by wasp infestation by analyzing wasp egg encapsulation in gcm KD condition. Similar to what we found with hopTum-l, Gcm has an anti-inflammatory potential. gcm KD mutant larvae show a higher rate of wasp egg encapsulation compared to control larvae, hence allowing fewer wasp eggs to develop. Moreover, fewer adult wasps hatch from gcm KD mutant larvae (Figure 7a,b). Thus, gcm KD animals mount an exacerbated response to an acute challenge. The inflammatory response upon wasp infestation is exacerbated in gcm KD animals. (a) Histogram representing the percentage of total, partial and no wasp egg encapsulation (n > 30). (b) Lethality of the parasitic wasp after infestation of Drosophila larvae (n = 4) (> 200 animals). Since Gcm is no longer expressed by the time of infestation (nor is its expression induced by infestation or by Jak/Stat activation, Figure 8—figure supplement 1), this developmental transcription factor likely has priming and long-lasting effects on the embryonic hemocytes. To test this hypothesis, we compared the levels of expression of several sets of genes in gcm mutant embryonic and larval hemocytes (Figure 8). The levels of the plasmatocyte marker eater start decreasing in the mutant embryos and are only significantly low in the larval stage. Similarly, the levels of the lamellocyte markers βint-v and PPO3 are only significantly high in the larva. 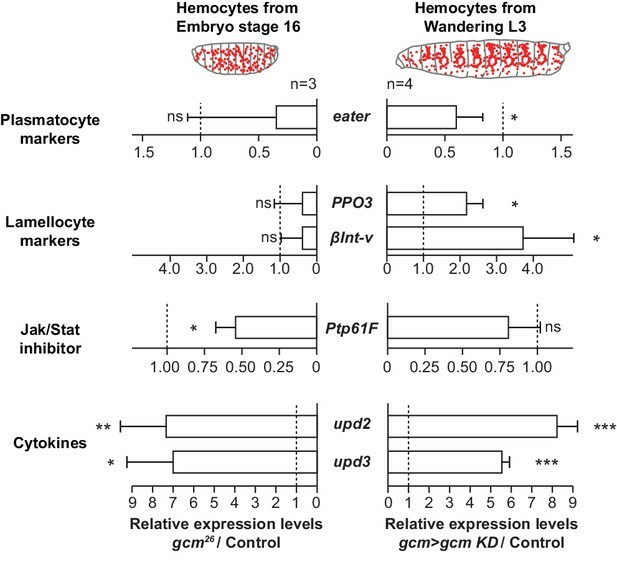 Also, embryonic mutant hemocytes show a decrease in the levels of the Ptp61F Jak/Stat inhibitor and direct target of Gcm (Figure 2d–f, Figure 1—figure supplement 4h) and this effect is lost at the larval stage, in line with the embryo-specific expression of Gcm (Figure 8). 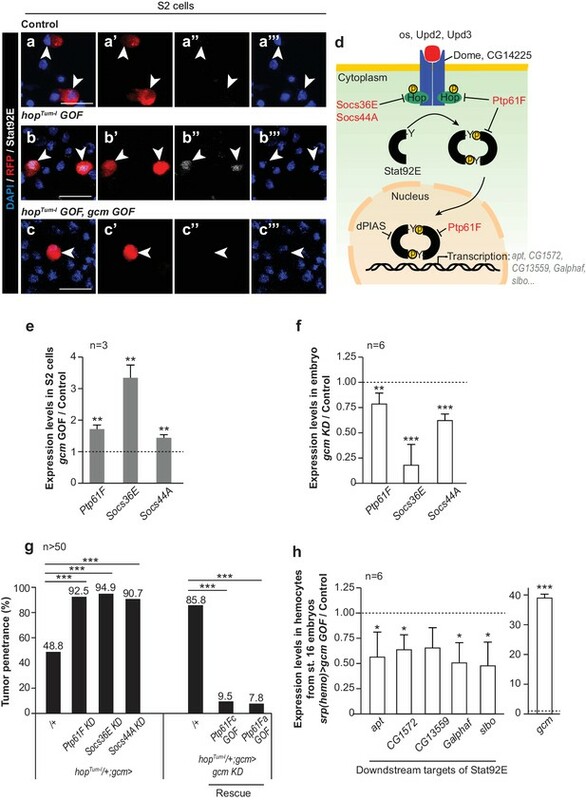 This decrease seems sufficient to enhance the expression of the cytokines upd2 and upd3 in embryonic stage, which persists in the larval stage (Figure 8). The initial effects observed in the embryo become more evident in the larva, likely through positive feedback loops. To eliminate the possibility that we underestimate the embryonic phenotype due to latency in the RNAi induced defects, we specifically analyzed gcm null embryos. Overall, these data suggest that Gcm modulates the level of activation of the Jak/Stat pathway at embryonic stage, which primes hemocytes into a state that is highly sensitive to inflammatory signals in the larval stage. Gcm impacts the development and the inflammatory response of hemocytes. Relative expression levels of plasmatocyte and lamellocyte markers, Jak/Stat inhibitor and cytokines in hemocytes from stage 16 mutant embryos (srp(hemo)> RFP,gcm [Cattenoz et al., 2016]) or from third instar mutant larvae (gcm> gcm KD). The levels represented are relative to the levels in controls (srp(hemo)> RFP for the embryos and gcm> for the larvae) after normalization against housekeeping genes. The data are displayed as described in Figure 1f. The above findings strongly suggest that the embryonic hemocytes may represent an early, perhaps the earliest cellular target of wasp infestation. To clarify this issue, we analyzed the timeline of three cellular processes that accompany the response to wasp infestation (Figure 9a): the mobilization of the resident hemocytes, the appearance of circulating hemocytes of larval origin, including the appearance of lamellocytes, the formation of melanotic tumors. Impact of the wasp infestation on the hemocytes. (a) Schematic of the correspondence between the timeline after egg laying (AEL) and the larval developmental stage. The wasp infestation was carried out at the L2 stage. (b–c) RFP signals from HmlΔRFP/+larvae at L1, L2, Early L3 and Late L3 stages (b) and Early L3 after wasp infestation (c). The HmlΔRFP transgene induces the expression of RFP in hemocytes starting from L1 (Makhijani et al., 2011). The larvae display an accumulation of hemocytes in the sessile pockets from the L2 stage onward. Upon wasp infestation, the sessile hemocytes are released into circulation. Scale bar: 200 µm. (d) Number of sessile pockets per Late L3 larva (one lateral view per larva = hemi larva) in normal conditions and after wasp infestation. Each hemi-larva is represented by a dot, the bar represents the average and the error-bars s.e.m., n > 11, p-value measured using student test after variance analysis. (e) Representative examples of melanotic tumors at different stages. Immunolabelling of tumors from gcm> gtrace LacZ larvae, 48 hr and 72 hr after wasp infestation. Phalloidin (green), Srp (red) and LacZ (white). Left panels show the merged channels, mid panels show LacZ and Srp labelling and the right panels show LacZ labelling alone. Scale bar: 100 µm. (f) Immunolabelling of gcm> gtrace LacZ larval hemocytes 2 hr, 24 hr and 72 hr after wasp infestation. Phalloidin (green), Srp (red) and LacZ (white). The left panels show the merged channels, the mid panels show LacZ labelling alone and the right panels show Srp labelling alone. Lamellocytes can be recognized by the strong expression of Phalloidin and by their very large size. Scale bar: 50 µm. At first, we followed the dynamic behavior of the hemocytes after embryogenesis using the HmlΔRFP (Makhijani et al., 2011) line. In physiological conditions, the hemocytes present in the 1st larval stage do not display a stereotyped arrangement (Figure 9b). Hemocytes start homing and localizing sub-epidermally by L2. The so-called sessile pockets become evident by Early L3 and the process continues until Late L3, when the population of resident hemocytes becomes very prominent and stereotyped. Upon wasp infestation, the resident compartments are already disrupted by Early L3 (30 hr after infestation), with many hemocytes being in circulation (Figure 9c,d). We quantified the phenotypes and counted in average 7.4 sessile pockets/larva (s.e.m. 0.27) in control and 1.2 pockets (s.e.m. 0.31) in infested animals. Thus, hemocyte mobilization is a very early event. We next traced the hemocyte lineage within the tumors (gcm> gtrace LacZ animals after wasp infestation) and labelled them with the Serpent antibody. In our conditions, the tumors start appearing by Late L3 and seem to mostly contain hemocytes of embryonic origin (Srp positive, LacZ positive) (Figure 9e). Tumor melanization (Figure 8—figure supplement 1d,d’) hampers proper immunolabelling and quantification of these cells, but clearly their contribution becomes very limited in tumors at later stages (Wandering L3), which are almost completely made of cells from the lymph gland (Srp positive, LacZ negative). We finally gtraced the embryonic hemocytes (circulating + sessile) and found that they are all of embryonic origin in L2 (2 hr after infestation) (Figure 9f). No lamellocyte can be observed by this stage. The hemocytes are all of embryonic origin by Early L3 as well (24 hr after infestation), but by this stage they start to differentiate into lamellocytes (48.8% express a lamellocyte identity). By contrast, most of the circulating hemocytes come from the lymph gland by Wandering L3 (72 hr after infestation), as only 10.4% are of embryonic origin, suggesting that the lymph glands histolyzed. At this stage, fewer lamellocytes are in circulation (7.8%), likely because they are recruited to the tumors that appear in late L3. Altogether, the developmental and lineage analyses strongly suggest that the sessile hemocytes are mobilized in response to the wasp infestation and start forming the melanotic tumors, to which the hemocytes of the lymph gland contribute at later stages (Figure 10). Wasp infestation recruits first the embryonic hemocytes and then the LG hemocytes. Timeline summarizing the sequence of events occurring in the immune system of the larva in normal conditions (top panel) and upon wasp infestation (lower panel). In normal conditions, only embryonic hemocytes (in red) are present in the hemolymph until the pupal stage. They start to colonize the sessile pockets by L2 and continue to do so during L3. The lymph gland (in blue) histolyzes at the beginning of pupal stage to release plasmatocytes into circulation. Upon wasp infestation (occurring at L2 stage), the sessile hemocytes are mobilized, embryonic plasmatocytes differentiate into lamellocytes (rhomboid shaped cells) and tumors start forming at Late L3 upon aggregation of the embryonic hemocytes. The lymph gland histolyzes precociously, to release plasmatocytes and lamellocytes that contribute to tumor formation in Wandering L3. Plasmatocytes and lamellocytes originating from the embryo are indicated in red, the ones from the lymph gland in blue. Lamellocytes originating from the embryo are indicated in red, the ones from the lymph gland are in blue. Immune cells play a key role in physiology and in pathology, therefore understanding how the different hematopoietic waves work is of fundamental importance in basic and medical science. We here show that the embryonic Drosophila hemocytes represent major mediators of the immune response by transducing signals that eventually affect the larval hematopoietic organ, the lymph gland. A crucial player of the underlying cellular network is the Gcm transcription factor, which is specifically expressed in the embryonic hemocytes and modulates the response to chronic and acute challenges. This transiently expressed factor does so by, at least in part, regulating the expression of inhibitors of the Jak/Stat pathway. The activation of this pathway in the embryonic hemocytes induces the overproduction of Upd2 and Upd3, two pro-inflammatory cytokines that in turn activate the Jak/Stat pathway in the muscles and the precocious histolysis of the lymph gland. In sum, a molecular cascade specific to the first hematopoietic wave has long-lasting effects that modulate the second wave and the inflammatory response. Gcm has been defined as a pioneer transcription factor (Cattenoz and Giangrande, 2015). Its total loss triggers embryonic lethality associated with the reduction of hemocytes’ number and the almost complete lack of glial cells (Bernardoni et al., 1997; Lebestky et al., 2000; Alfonso and Jones, 2002; Vincent et al., 1996; Hosoya et al., 1995; Jones et al., 1995). Using genetic backgrounds that trigger a partial loss of Gcm we could bypass the early defects and reveal its requirement in the immune response (this paper) and in glial migration (Gupta et al., 2016), showing that pioneer factors have a much broader spectrum of activities than expected. The late functions (glial migration, hemocyte response to inflammation) require lower levels of Gcm than the early functions (glial and hemocyte differentiation), therefore the potential of this transcription actor depends on the cellular context. Interestingly, the late functions seem associated with a modulatory role. In glial migration, Gcm affects the timely initiation of migration and in the immune response as well, Gcm works as a modulator rather than an instructive factor. Typically, downregulating Gcm does not on its own trigger overt signs of inflammation (hemocyte mobilization, lamellocyte differentiation, melanotic tumors or precociously histolyzed lymph glands). Gcm allows the proper development of hemocytes that are later able to respond to chronic or acute challenges. Such developmental role fits with the early and transient expression of Gcm in the hemocyte lineages together with the instability of its transcript and product (Cattenoz and Giangrande, 2015). Gcm negatively controls the Jak/Stat pathway upon inducing the expression of the Ptp61F and Socs36E inhibitors in the embryonic hemocytes. We provide several lines of evidence for Jak/Stat pathway inhibition by Gcm to have long-lasting effects. First, over-activating the Jak/Stat pathway specifically in the embryonic hemocytes triggers the formation of melanotic tumors and precocious lymph gland histolysis. Second, silencing Gcm or activating the Jak/Stat pathway in the embryonic hemocytes triggers the overproduction of pro-inflammatory Upd cytokines that act non-autonomously and trigger both tumor formation and precocious lymph gland histolysis. Third, Gcm downregulation triggers the sustained expression of those cytokines in the larval hemocytes, likely through Jak/Stat auto- and cross-regulation. The fact that Gcm expression is not under the control of the immune challenge (Jak/Stat over-activation or wasp infestation) also supports the hypothesis that the observed phenotypes are due to a developmental defect. Additional factors likely contribute to the long-lasting effects of modulating Gcm expression in the embryo. In addition, the DamID screen identified Gcm direct targets that are required late in hematopoiesis and/or in hemocyte functions, such as phagocytosis, autophagy and defense response to fungi and Gram-negative bacteria (Cattenoz et al., 2016). Thus, Gcm may also directly impact late events in the immune system, as is the case in the nervous system where it induces threshold expression levels of a chemoattractant receptor that promotes glial migration (Gupta et al., 2016). Finally, the exacerbated response to acute or chronic challenges due to the low levels of Gcm in the embryonic hemocytes indicate that active repression of the pro-inflammatory Jak/Stat pathway may be required to ensure a fast and efficient response upon challenges. The finding that altering the expression levels of a developmental factor triggers an inflammatory response that is too strong or too weak, which are both detrimental conditions, constitutes an additional level of control and opens novel perspectives for understanding the molecular mechanisms that modulate the inflammatory response in humans as well. This is particularly exciting in view of recent findings showing that prenatal inflammation and altered development of microglia, the immune cells of the brain, affect the postnatal function of the brain (Thion and Garel, 2017). The role of Gcm is to prevent a state of chronic inflammation induced by the Jak/Stat pathway. Gcm controls the ‘inflammatory competence’ at least in part by inducing the expression of Ptp61F, Socs36E and Socs44A, which inhibit the Jak/Stat pathway. In so doing, Gcm prevents the production of the Upd2 and Upd3 pro-inflammatory cytokines, whose over-expression is sufficient to induce the inflammatory response (Figure 11). 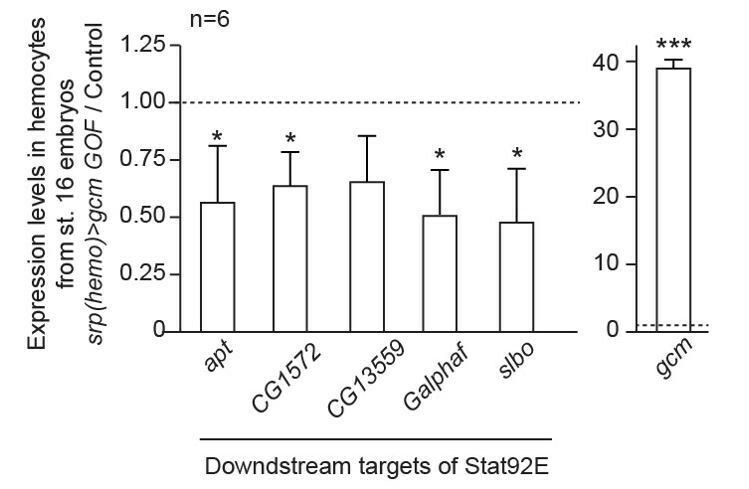 Gcm also directly interacts with dPIAS (Jacques et al., 2009), which targets Stat92E for degradation via SUMOylation (Kotaja et al., 2002) and dPIAS induces melanotic tumors when mutated, due to Stat92E constitutive activation (Betz et al., 2001; Hari et al., 2001). Thus, Gcm can inhibit the Jak/Stat pathway at least in two ways, by regulating the transcription of the inhibitors, and, in cells in which the Jak/Stat pathway is activated, by binding dPIAS, which in turn inhibits the transcriptional activity of phosphorylated Stat92E. Schematic model on the molecular cascade leading to tumor formation upon Jak/Stat activation in the embryonic hemocytes. (a) gcm> hopTum-l activates the Jak/Stat pathway exclusively in the hemocytes at embryonic stage. This leads to the production of the Upd2/Upd3 pro-inflammatory cytokines in those cells and to the activation of the Jak/Stat pathway in the larval muscles. This ultimately results in the formation of melanotic tumors and in lymph gland histolysis. When gcm> hopTum-l is combined with gcm KD (b), the levels of the inhibitors of the Jak/Stat pathway controlled by Gcm (i.e. Ptp61F, Socs36E and Socs44A) decrease in the embryonic hemocytes. This leads to a stronger activation of the Jak/Stat pathway in embryonic hemocytes, which enhances the production of Upd2/Upd3 and the activation of the Jak/Stat pathway in the muscles. As a consequence, gcm> hopTum-l, gcm KD animals display stronger phenotypes in terms of lymph gland histolysis and melanotic tumors. 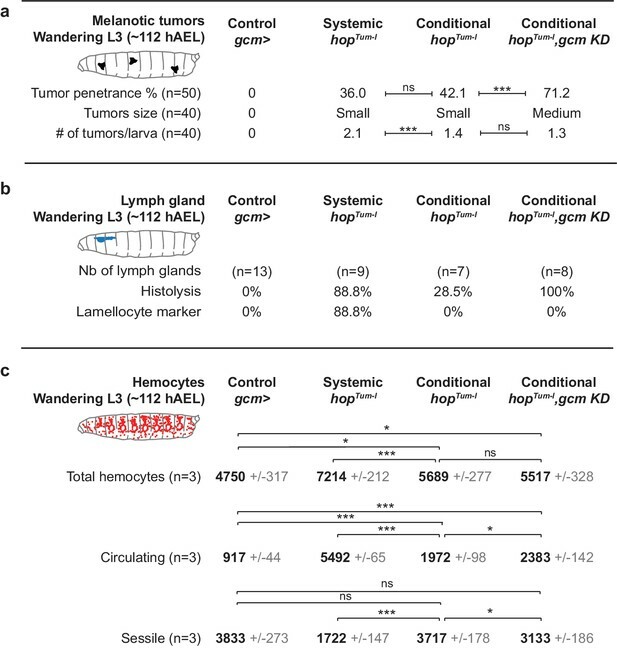 Despite the multiple levels of regulation, Gcm does not affect all the processes that depend on the Jak/Stat pathway, nor do all the Gcm dependent phenotypes seem to rely on the Jak/Stat pathway: on the one hand, silencing Gcm expression has modest impact on the hemocyte proliferation observed in hopTum-l animals. On the other hand, the conditional over-activation of the Jak/Stat pathway does not affect hemocyte mobilization, whereas silencing Gcm does, likely through the defective expression of genes required for the attachment of hemocytes to the sessile compartment such as eater (Anderl et al., 2016). Moreover, Gcm modulates the response to wasp infestation, which involves the Jak/Stat pathway and additional cascades. How broad is the modulatory role of Gcm in the inflammatory response will await further investigation, but our findings call for a complex cellular network modulating the immune response through multiple organs and tissues including at least the embryonic hemocytes, the muscles and the lymph glands. The future challenge will be to dissect this network and assign specific role to the different tissues and cell types. This will likely include a major player in the humoral response orchestrated by the fat body, which also secretes molecules necessary to mobilize the sessile hemocytes (Vanha-Aho et al., 2015). The Gcm transcription factor provides a new key to investigate the basis of the inflammatory response driven by these complex cellular and molecular interactions. Given the overall evolutionary conservation of the hematopoietic cascades, Gcm orthologous genes may have similar roles. Interestingly, the sea urchin gcm orthologue is expressed and required for the differentiation of pigment cells, which function as immune cells (Calestani et al., 2003). Focusing on the murine Gcm orthologue will possibly reveal a conserved function in immune/inflammatory responses in higher organisms as well. Previous studies have shown that circulating hemocytes play a central role in the inflammatory responses induced by the fat body (Pastor-Pareja et al., 2008; Vanha-Aho et al., 2015; Schmid et al., 2014) and by the somatic muscles (Yang et al., 2015). These circulating hemocytes comprise hemocytes of embryonic origin and hemocyte released from the lymph gland upon immune challenges. The use of gcmGal4 and srp(hemo)Gal4 drivers allowed us to dissect the role and the regulation occurring specifically in the embryonic hemocytes. These cells likely represent the earliest cellular target upon wasp infestation (extending on data from [Márkus et al., 2009; Zettervall et al., 2004]), in a sequence of events that include the mobilization of resident hemocytes, the formation of tumors and the histolysis of the lymph gland. Together with the finding that gcm KD leads to the production of hemocytes that respond much more strongly to inflammatory cues, this demonstrates that an adequate immune response relies on signaling from the embryonic to the larval hematopoietic wave (Figure 11). Embryonic hemocytes may play a primordial role by initiating the inflammatory response, which alerts all the tissues including the larval hematopoietic organs: this was observed by expressing hopTum-l in embryonic hemocytes and noticing the impact on the somatic muscles and the lymph gland. They can also act as transducers of the inflammatory signals between the different organs through the production of the pro-inflammatory cytokines, as knocking down the cytokines in the embryonic hemocytes strongly decreases the systemic inflammation induced by the hopTum-l mutation. In sum, the present work reveals the homeostatic interactions between hematopoietic waves, which ensure an appropriate inflammatory response to acute or chronic challenges. Given that different hematopoietic waves give rise to immune cells that coexist and are endowed with specific properties in vertebrates, it will be interesting to assess whether similar homeostatic interactions take place in higher organisms. Flies were raised on standard media at 25°C. The strains and crosses are detailed in Supplementary Methods. In all the figures, the larvae were staged as follow: We selected Wandering L3 that never went back to the food, were still very mobile and did not show spiracle eversion (this corresponds to a relatively narrow window around ~112 hAEL). At this stage, 6–8 hr are required for pupariation to occur. All other staging (L1, L2, Early L3, Late L3) were done relative to the time of egg laying: L1:~36 hAEL; L2:~60 hAEL; Early L3:~74 hAEL; Late L3:~98 hAEL). The stages of L2 and Early L3 were further distinguished by observing the morphology of the anterior spiracles as previously described (Guha and Kornberg, 2005). Tumor penetrance was determined by assessing the percentage of 3rd instar larvae carrying one or more tumors. To assess the expressivity of the phenotype, we classified the tumors into three categories according to their size: Small (S), Medium (M) and Large (L) (Müller et al., 2005). A tumor was considered as small when a tiny melanotic mass was documented (Figure 1—figure supplement 4d, left panel), as medium, when the melanotic mass covered ¼ the distance between the borders of a segment (Figure 1—figure supplement 4d, mid panel) and as large when the melanotic spot covered ½ the distance between the borders of a segment (Figure 1—figure supplement 4d, right panel). The expressivity of the melanotic tumor phenotype represents the percentage of small, medium and large tumors counted in each genotype. The p-values were estimated using the chi-squared test for frequency comparisons between two populations. Ten third instar larvae were washed in Ringer’s solution (pH 7.3–7.4) containing 0.12 g/L of CaCl2, 0.105 g/L KCl, and 2.25 g/L NaCl, then dried, and bled in a 96-well U-shaped microtiter plate containing 50 µL of Schneider medium complemented with 10% Fetal Calf Serum (FCS), 0.5% penicillin, 0.5% streptomycin (PS), and few crystals of N-phenylthiourea ≥98% (PTU) (Sigma-Aldrich P7629) to prevent hemocyte melanization (Lerner and Fitzpatrick, 1950). For circulating hemocyte collection, the hemolymph was gently allowed to exit, and the total volume was transferred onto a hemocytometer, where the total number of cells were counted, multiplied by the original volume (50 µL) and the average number of hemocytes per larva was calculated as described in (Kacsoh and Schlenke, 2012). For sessile hemocyte collection, the hemolymph containing the circulating hemocytes was transferred to a first well, while sessile hemocytes were scraped and/or jabbed off the carcass in a second well as described in (Petraki et al., 2015) and counted as above. Each counting was carried out at least in triplicates. The p-values were estimated after variance analysis using bilateral student test (see statistics section). Ten third instar larvae were treated as stated above and bled in a 96-well U-shaped microtiter plate containing 200 µL of Schneider medium. Circulating and sessile hemocytes were collected as indicated above and transferred onto a slide using the Cyto-Tek 4325 Centrifuge (Miles Scientific). Samples were then fixed for 10 min in 4% paraformaldehyde/PBS at room temperature (RT), incubated with blocking reagent (Roche) for 1 hr at RT, incubated overnight at 4°C with primary antibodies diluted in blocking reagent, washed three times for 10 min with PTX (PBS, 0.3% triton-x100), incubated for 2 hr with secondary antibodies, washed twice for 10 min with PTX, incubated for 20 min with DAPI to label nuclei (Sigma-Aldrich) (diluted to 10−3 g/L in blocking reagent), and then mounted in Vectashield (Vector Laboratories). The slides were analyzed by confocal microscopy (see section below on confocal imaging). The following combination of primary antibodies was used to determine the fraction of lamellocytes: rabbit anti-Serpent (1/1000) (Trébuchet, unpublished results) was used to label hemocytes. Serpent is expressed in all hemocyte precursors and is required for the development of plasmatocytes and crystal cells (Lebestky et al., 2003). Mouse anti-L4 (1/30) was kindly provided by I. Ando, L4 is an early lamellocyte marker expressed after immune stimulation (Honti et al., 2010). 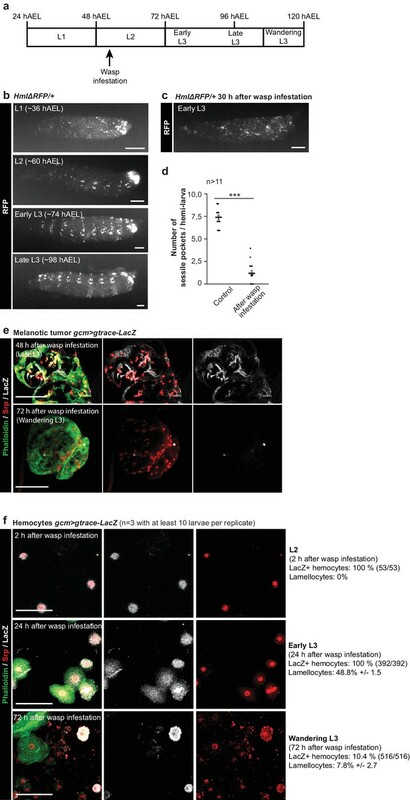 The fraction of lamellocytes was determined by counting the number of L4/DAPI positive cells out of the total population of hemocytes present in six confocal fields of vision at 40X magnification and based on Z-series projections. The following combination of primary antibodies was used to determine the fraction of dividing blood cells: rabbit anti-PH3 (1/1000) (Upstate biotechnology #06–570), to assess the mitotic activity, and mouse anti-Hemese (1/30), kindly provided by I. Ando, which recognizes a glycosylated transmembrane protein belonging to the sialophorin protein family and expressed in all larval hemocytes (Kurucz et al., 2003). The fraction of dividing cells was determined by counting the number of PH3/Hemese/DAPI positive cells out of the total population of hemocytes, as above. The following combination of primary antibodies was used to determine the fraction of crystal cells: rabbit anti-Serpent (1/1000) and chicken anti-GFP (1/500) (abcam #13970), directed against the membrane GFP signal in lzGal4,UAS-mCD8GFP driver expressed in crystal cells. The fraction of crystal cells was determined by counting the number of GFP/Srp/DAPI positive cells out of the total population of hemocytes, as above. Secondary antibodies were: donkey anti-rabbit coupled with Cy3 (1/600) (Jackson #711-165-152), donkey anti-mouse coupled with Cy3 (1/600) (Jackson #715-165-151), goat anti-mouse coupled with FITC (1/400) (Jackson #115-095-166), goat anti-mouse coupled with Alexa Fluor 647 (1/400) (Jackson #115-175-100) and goat anti-rabbit coupled with Alexa Fluor 647 (1/400) (Jackson #711-175-144). Each immunolabelling was carried out on three independent trials. The p-values were estimated after variance analysis using bilateral student test. Six 3rd instar larvae were washed in 1X PBS and heated at 70°C for 10 min in 500 µL of 1X PBS. This procedure leads to the activation of prophenoloxidases (PPOs) within the crystal cells and as a result, these cells appear as black superficial spots on the larval cuticle (Binggeli et al., 2014; Rizki et al., 1980). 3rd instar larval lateral view images were taken under the fluorescent macroscope (Leica, Z16 APO) to cover parts of the dorsal and ventral sides, and superficial crystal cells were counted as described in (Bretscher et al., 2015). The p-values were estimated after variance analysis using bilateral student test. S2 Drosophila cells from ATCC Ref: CRL-1963 were used. The identity has been athenticated (STR profiling). No mycoplasm contamination. Six million (6E6) Drosophila S2 cells were plated per well in a 6-well plate with 1.5 mL of Schneider medium +10% FCS+0.5% PS. Transfections were carried out 12 hr after plating, using the Effectene Transfection Reagent (Qiagen) as described in (Cattenoz et al., 2016). These transfection assays were used to assess the transactivation potential of (i) Gcm, (ii) HopTum-1, (iii) the impact of Gcm on Stat92E localization and (iv) to assess the gcm RNAi efficiency. To determine the role of Gcm in inducing Ptp61F, Socs36E, Socs44A, Upd2 and Upd3 expression, 2 µg of pPac-gcm expression vector (Miller et al., 1998) was transfected with 1 µg of 4.3 kb repo-GFP (repoGFP) (Laneve et al., 2013): Gcm induces the expression of its target repo and drives the expression of GFP, allowing us to recognize and sort the transfected cells (Laneve et al., 2013). Co-transfection of 2 µg of pPac-gal4 driver plasmid and 1 µg of pUAS-GFP reporter plasmid was performed as a negative control (Figures 2e and 4g). To determine the role of hopTum-l in inducing Upd2 and Upd3 expression, 0.5 µg of pPac-gal4 plasmid, 0.5 µg of pUAS-GFP and 0.5 µg of pUAS-hopTum-l reporters were co-transfected (Harrison et al., 1995). Co-transfection of 0.5 µg of pPac-gal4 driver plasmid and 0.5 µg of pUAS-GFP, and 0.5 µg of pUAS-Empty was performed as a negative control (Figure 4g). To assess the impact of Gcm on Stat92E localization/expression, S2 cells were transfected as described above with 0.5 µg pPac-gal4 and 0.5 µg pUAS-RFP (Control), or 0.5 µg pPac-gal4, 0.5 µg pUAS-RFP and 0.5 µg pUAS- hopTum-l (hopTum-l GOF), or 0.5 µg pPac-gal4, 0.5 µg pUAS-RFP, 0.5 µg pUAS- hopTum-l and 0.5 µg pPac-gcm (hopTum-l GOF, gcm GOF). 48 hr after transfection, the cells were immunolabelled with rabbit anti-Stat92E (1/100, kindly provided by Dr. D. Montell [Jang et al., 2009]) and rat anti-RFP (1/500, Chromotek #5F8) as described for the hemocytes (Figure 2a–c). To assess the gcm RNAi efficiency, S2 cells were transfected as described above with 0.25 µg pPac-gal4 driver, 0.25 µg of pUAS-gcm expression vector, 0.25 µg of 4.3 kb repo-GFP (repoGFP) (Laneve et al., 2013), 0.25 µg of pUAS-RFP reporter and 0.25 µg of pUAS-gcmRNAi vector (Vienna Drosophila Resource Center (VDRC) #dna1452, used to build the UAS-gcmRNAi strain Bloomington #31519). The controls were S2 cells transfected with the same set of plasmids except for pUAS-gcm or pUAS-gcmRNAi that were replaced by pUAS-Empty vector. The levels of GFP and RFP were analyzed 48 hr after transfection using FACSCalibur. The GFP levels were measured in RFP positive cells (Figure 1—figure supplement 3a). For the transfection assays, each combination of plasmids was mixed in 90 µL of EC buffer and 8 µL of enhancer per µg of plasmid followed by 5 min incubation at RT. 25 µL of Effectene was then added and the mix was incubated at RT for 20 min. Then, 500 µL of Schneider medium +10% FCS+0.5% PS was added to the mix followed by spreading it on the cells. For (i) and (ii), plates were then incubated at 25°C for 48 hr followed by sorting on a BD FACSAria, according to GFP or RFP expression to obtain more than 80% of transfected cells in the sample (Cattenoz et al., 2016). RNA was then extracted using TRI reagent (Sigma-Aldrich), 1 µg was treated by DNAse1 (RNAse-free) (Thermo Fisher Scientific) and reverse transcribed with Superscript II (Invitrogen). Quantitative PCR (qPCR) assays were performed on a lightcycler LC480 (Roche) with SYBR master (Roche) on the equivalent of 5 ng of reverse transcribed RNA with the primer pairs targeting Ptp61F, Socs36E, Socs44A, upd2 and upd3 listed in supplementary methods. Each PCR was carried out in at least three independent replicates. The quantity of each transcript was normalized to the levels of transcripts of two different housekeeping genes, Glyceraldehyde-3-phosphate-dehydrogenase-1 (Gapdh1) and Actin-5c (Act5c). The p-values were estimated after comparing control to transfected cells using bilateral student test. For embryonic hemocytes, stage 16 embryos carrying srp(hemo)> RFP (see supplementary methods) were dissociated in PBS using a Dounce homogenizer on ice. The RFP positive cells were then sorted after filtration on a 70 µm filter on a BD FACSAria. At least 10,000 RFP positive cells were used per replicate. For the larval hemocytes, thirty 3rd instar larvae were bled in a 96-well U-shaped microtiter plate containing 200 µL of Schneider medium to collect circulating hemocytes as stated above. Cells were centrifuged at 3000 rpm for 10 min at 4°C. RNA was then extracted using TRI reagent and Quantitative PCR (qPCR) assays were performed on a lightcycler LC480 as stated above with the primer pairs listed in supplementary methods targeting plasmatocytes markers (Stofanko et al., 2010): crq, Hml, lectin-24A, eater, He and NimC1; lamellocyte markers: Filamin-240 (cher), α-PS5 (ItgaPS5), mys, βInt-ν (Itgbn), Tep1, Tep4 and PPO3; crystal cell markers: lz, hnt (peb) and PPO1; pro-inflammatory cytokines: upd2 and upd3. Each PCR was carried out in at least three independent replicates. The p-values were estimated after comparing control to transfected cells using bilateral student test (see below). Lymph glands from 3rd instar wandering larvae (6 h-8h before pupariation) were dissected in Ringer’s solution (pH 7.3–7.4), fixed for 30 min in 4% paraformaldehyde/PBS at 4°C, washed three times for 10 min with PTX, incubated with blocking reagent for 1 hr at 4°C, incubated overnight at 4°C with primary antibodies, washed three times for 10 min with PTX, incubated for 1 hr with secondary antibodies, washed two times for 10 min with PTX, incubated for 20 min with DAPI and then mounted on slides in Vectashield. The slides were analyzed by confocal microscopy (see below). The primary antibody was the mouse anti-L4 (1/30). The secondary antibody was the goat anti-mouse coupled with FITC (1/400) (Jackson #115-095-166). The percentage of precociously histolyzed and lamellocyte expressing lymph glands was assessed. Note that in genotypes carrying the hopTum-l systemic mutation most lymph glands lose their integrity and display only part of the primary and/or secondary lobes because the tissue undergoes precocious histolysis. Drosophila embryos from overnight egg laying at 25°C on apple agar plates were collected, treated and immunolabelled as described in (Vincent et al., 1996). They were dechorionated in bleach, rinsed in water then fixed in a solution containing 1 vol. of heptane and 1 vol. of 4% paraformaldehyde in PBS 1x for 25 min. Next, they were devitellinized in methanol and heptane for 1 min followed by treatment with PTX and incubation in blocking reagent for 1 hr at RT. Then, embryos were incubated overnight at 4°C with primary antibodies, washed three times for 10 min with PTX, incubated for 2 hr with secondary antibodies, washed two times for 10 min with PTX, incubated for 20 min with DAPI and then mounted on slides in Vectashield. The slides were analyzed by confocal microscopy (see section below). The following combination of primary antibodies was used to label crystal cells: rabbit anti-PPO1 (1/100) was kindly provided by WJ. Lee. PPOs are essential enzymes in the melanization process, where PPO1 is crystal cell specific marker (Binggeli et al., 2014; Nam et al., 2012). Chicken anti-GFP (1/500) (abcam #13970) was used to select for right genotype embryos based on CyOactinGFP expression. Rabbit anti-RFP (1/500) (abcam #62341) was directed against the RFP signal driven by lzGal4 driver expressed in crystal cells. Secondary antibodies used were: donkey anti-rabbit coupled with Cy3 (1/600) (Jackson #711-165-152) and donkey anti-chicken coupled with FITC (1/400) (Jackson #703-095-155). Activation of the Jak/Stat pathway was observed in the muscles using the 10xStat92E-GFP reporter as indicated in (Yang et al., 2015). The larvae were frozen and mounted between two slides in water. The images of the larvae were taken at the fluorescent macroscope (Leica, Z16 APO) using 10X magnification and 500 ms of exposure time. The contrast and luminosity of each image were adjusted using Fiji (Schindelin et al., 2012); the same correction was applied to all conditions. In a second approach, Stat92E was directly labelled in striated muscles. Larvae were prepared using the same approach than for the lymph gland described above and labelled with Phalloidin coupled with FITC (1/200), rabbit anti-Stat92E (1/100, kindly provided by Dr. D. Montell [Jang et al., 2009]) and DAPI. The images were acquired with Leica SP5 inverted-based confocal microscope using hybrid detectors in photon counting mode and analyzed using the measurement plugin from the software Fiji (Schindelin et al., 2012). For total Stat92E quantification, areas covering the muscle on single confocal plans were selected and the absolute intensity/area(µm²) of Stat92E signal were calculated for at least 20 muscles in three animals per genotype. To calculate the ratio nuclear/cytoplasmic, Stat92E levels were measured in each nucleus individually and coupled with the levels in an area of the same size adjacent to the nucleus. The nuclei were identified using the DAPI signal. 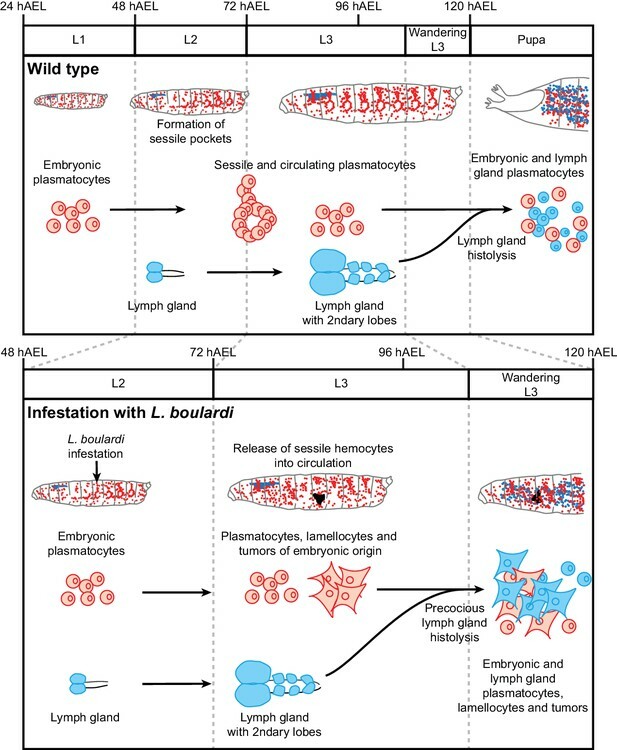 Wasp parasitization by L. Boulardi is commonly used to study the immune response of Drosophila (Yang et al., 2015; Small et al., 2012; Vanha-Aho et al., 2015; Kari et al., 2016). The wasp lays eggs in the Drosophila larva, which induces a strong systemic inflammatory cascade that leads to the differentiation of plasmatocytes into lamellocytes and to the encapsulation of the wasp egg (Small et al., 2012). The wasp survival and encapsulation assays were conducted as described in (Vanha-Aho et al., 2015; Kari et al., 2016) with some modifications. For wasp survival, 100 first instar Drosophila larvae (~24 hAEL) of the indicated genotypes were transferred into a fresh vial at 25°C. At second instar stage (~54 hAEL), 20 couples of L. boulardi were added into the vial for infestation for 2 hr, then removed. Following this, the number of wasps hatching from each vial was counted to estimate the % of lethality (1-wasps/Drosophila larvae). The sessile pocket observation and the gtrace experiment presented in Figure 9 were done with this infestation protocol. For the encapsulation assay, Drosophila of the indicated genotypes were allowed to lay eggs for 24 hr at 25°C. The vials containing the embryos were then transferred to 29°C until the second instar stage (48 hr). The Drosophila larvae were then exposed to 10 couples of L. boulardi for 2 hr at 25°C and after parasitization the vials were incubated at 29°C until the third instar stage. Wandering larvae were dissected to assess the level of melanization of the wasp larvae: total encapsulation (dead wasp larvae completely melanized), partial encapsulation (living larvae, with some melanization), no encapsulation (living larvae, no melanization). Only Drosophila larvae containing a single wasp larva were analyzed. The DNA adenine methyltransferase identification (DamID) is an antibody independent method allowing the identification of loci bound by transcription factors (van Steensel and Henikoff, 2000; van Steensel et al., 2001). Using this approach, the Gcm binding sites in the Drosophila genome were recently determined (Cattenoz et al., 2016). The peaks indicating Gcm binding onto the Ptp61F, Socs36E and Socs44A loci are represented in Figure 1—figure supplement 4g–i using the University of California Santa Cruz (UCSC) Genome Browser (https://genome.ucsc.edu). The chi-squared test for frequency comparisons between two populations was used to estimate the p-values between percentages of tumors in 3rd instar larvae and the expressivity of melanotic tumors in various genotypes tested, where bilateral student test is not applicable. Variance analysis using bilateral student tests for unpaired samples was used to estimate the p-values in hemocyte counting, hemocyte immunolabelling and qPCR assays; in each case, at least three independent trials were performed. In all analyses, ‘ns’ stands for not significant, for p-value> 0.05; ‘*' for p-value<0.05; ‘**' for p-value<0.01; ‘***' for p-value<0.001. All the P values are in Figure 1—source data 1. Leica SP5 inverted-based microscope equipped with 20, 40 and 63X objectives was used to obtain confocal images. GFP/FITC was excited at 488 nm; the emission filters 498–551 were used to collect the signal. Cy3 was excited at 568 nm; emission filters 648–701 were used to collect the signal, and Cy5 was excited at 633 nm; emission signal was collected at 729–800 nm. A step size between 0.2 and 2 μm was used to collect the Z-series of images, which were then treated with Fiji (Schindelin et al., 2012) to obtain fluorescent images using maximum Z-projections. In all images, the intensity of the signals was set to the same threshold in order to compare the different genotypes. Journal of Cell Science 127:101–110. Annual Review of Immunology 25:745–785. Nature Reviews Molecular Cell Biology 18:56–67. Development Genes and Evolution 223:103–115. The International Journal of Developmental Biology 53:1013–1022. Molecular and Cellular Biology 22:5222–5234. Development Genes and Evolution 213:477–491. Disease Models and Mechanisms 1:144–154. Journal of Visualized Experiments e52733. Wilhelm Roux's Archives of Developmental Biology 188:91–99. Journal of Visualized Experiments e3347. Developmental Dynamics : An Official Publication of the American Association of Anatomists 236:2101–2108. Current Opinion in Neurobiology 47:121–130. Developmental & Comparative Immunology 36:638–647. The Journal of Cell Biology 197:477–486. Thank you for submitting your article "Embryonic hematopoiesis modulates the inflammatory response and larval hematopoiesis in Drosophila" for consideration by eLife. Your article has been reviewed by three peer reviewers, and the evaluation has been overseen by Utpal Banerjee as Reviewing Editor and K VijayRaghavan as the Senior Editor. The following individual involved in the review of your submission has agreed to reveal their identity: Élio Sucena (Reviewer #1). The manuscript by Dr. Giangrande and coworkers describes the early events during the embryonic wave of hematopoiesis with the larval wave of de novo blood cell formation. The manuscript describes a link in the regulation of inflammation and its threshold of response between events that, in the past, have been described as independent events separated in time and location. The conclusions represent novel advancements to the field of Drosophila hematopoiesis. Although the overall perception of the work is positive, several suggestions from the reviewers need to be attended to before the manuscript is reconsidered for publication. 1) There is a persistent gap in linking a causal role played by between Gcm and the series of phenotypes that are attributed to its loss of function. As the authors realize, the number of hemocytes/lamellocytes changes as a consequence of LG integrity or by sessile clusters (SC) recruitment. The number of melanotic tumors is also a consequence of lamellocyte production, which in turn may (or may not) be a consequence of LG histolysis. It is unclear what is/are the phenotype(s) directly caused by GCM? It is important to address this question in order to clearly delineate the mechanism. 2) Related to the above, the broad term "inflammatory response" is neither justified nor necessary in explaining the phenotype. What needs to be made clear, instead, is a careful description of the timeline of events. For example, it is not clear whether histolysis precedes the situations described in Figures 1, 3, 4 and the corresponding text. Similarly, what was the SC status when these hemocyte counts were made? For example, it is unclear in most cases (e.g. Figures 1, 3 and 4, subsection “Gcm regulates signaling from the embryonic to the larval hematopoietic wave”, fourth paragraph) whether there had been histolysis or what was the status of the SCs when haemocyte counts were made. Does gcm directly affect SC recruitment, histolysis or both? Similarly, is the appearance of lamellocytes related to a later event? If the primary cause is histolysis, the term inflammatory response is an exaggeration as being something induced by GCM. 3) The notion that gcm suppresses JAKSTAT pathway, which normally activates the expression of pro-inflammatory cytokines that signal the LG is well supported, but it is important to know what relays the triggering role of gcm at embryogenesis to a process that lasts up to late L3? The persistence of this phenomenon remains unexplored. Is the role of GCM to prevent a state of chronic inflammation by the JAK/SYAY pathway? Could the authors directly test this somehow, perhaps by determining the status of JAKSTAT activation across stages in Hop activated mutants with or without gcm KD? a) Figure 1—figure supplement 2, and would be helpful to show a lower magnification picture that shows the whole embryo. Staining is for crystal cells, not plasmatocytes, yet state in the text there is only a slightly reduced number of plasmatocytes. This needs to be shown. b) What is the purpose of Figure 1F, H? These images don't seem to add much to the paper. Phalloidin is also not a lamellocyte specific marker. c) The images in Figure 2A, C are out of focus and overexposed. As a consequence, they are uninformative and need to be improved. d) In Figure 3B and Figure 4A, the quantification of lamellocyte expansion is carried out by scoring the percentage of larvae with L4 staining. This needs to be supplemented with the number of lamellocytes counted in each larva. e) Figure 1—figure supplement 3H, I: these images add very little to the paper and the quality is rather poor. They should be improved or removed. Figure 8—figure supplement 1A and B need to be improved. Higher magnification images would improve this figure markedly. 5) The use of gcmGAL for "specific" knockdown in the embryonic hemocytes needs to be justified and demonstrated. For example, demonstrate that the drivers do not have even weak expression in the LG. Any expression of the driver in other tissues? Control to show glial expression does not interfere with the phenotype is missing. Also show another hemocyte driver as control to show same effects. Figure 4A, D: These data are not convincing as numbers analyzed are low. The change in levels or lack thereof needs to be demonstrated by qRTPCR. In general a series of RTPCRs will rule out changes due to LG or glial expression. In Figure 4H: will gcm expression in fat body have the same effect on lymph gland? Or is it residual expression of gcmGAL4 in LG? How does the hemocyte signal to LG? Is it through fat body or the CNS? The authors should discuss how the signaling is sustained after expression of gcm in embryonic hemocytes. What about the effect of neural expression? It is not really clear that there is a cascade from only embryonic hemocytes. How do the authors rule out the possibility that a gcm target in nonhematopoietic tissue sustains the inflammation? For example, demonstrate that the effects seen are not because of gcm expression in glia. 7) Figure 2: It would be more relevant to misexpress gcm in vivo in embryonic hemocytes and other tissues, rather than in S2 cells and evaluate pathway inhibitor expression as well as stat activation in the lymph gland. Also, for Figure 2E, F: Without molecular and biochemical analysis it is not possible to comment on GCM transcriptional effect being direct. Also the reduction is significant only for socs. The text should be edited appropriately or additional evidence provided. Point 1, 2 will be dealt with together as they concern related issues. The reviewers ask what is the timeline of events that involve LG histolysis and what is the role of Gcm. Altogether, our data allow us to propose that Gcm has direct effects on the hemocytes, including a negative impact on lamellocyte differentiation, and that this gene also affects the ability of the hemocytes to communicate with the rest of the body. To further characterize the direct and the indirect effects of Gcm, we performed additional experiments on the circulating and on the sessile hemocytes as well as on the tumors and on the lymph gland, shown in Figure 2H, 3G-K, 6A-E, 9A-F, Figure 5—figure supplement 1J-K.
1) We describe the timeline of events. 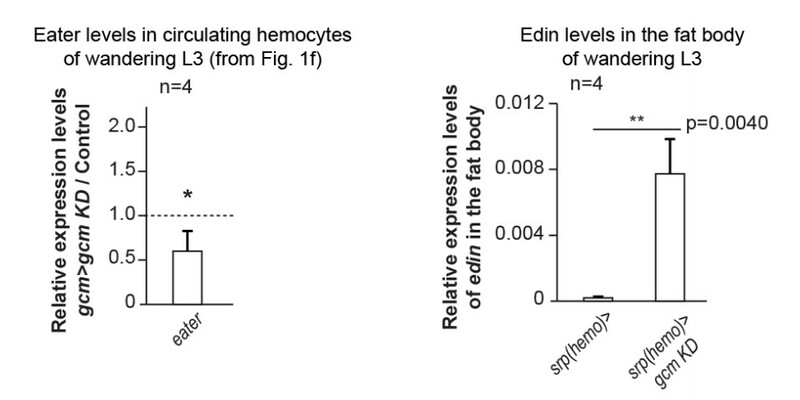 We lineage traced the circulating hemocytes at different times upon wasp infestation and showed that the initial response comes from the embryonic hemocytes, followed by the recruitment of hemocytes of larval origin. We present these data in Figure 9F. By L2 (2 h after infestation), the circulating hemocytes are all of embryonic origin. By early L3 (24 h after infestation), they also are of embryonic origin and half of them express a lamellocyte identity. By wandering L3 (72 h after infestation), most of the circulating hemocytes come from the LG. Overall, fewer lamellocytes are in circulation, likely because they are recruited to the tumors. 2) We analyze the melanotic tumors induced by wasp infestation. We lineage traced the hemocytes in the tumors and found that those of embryonic origin are the first contributors. We present these data in Figure 9E. By late L3 (48 h after infestation), the tumors are mostly composed of embryonic hemocytes. By wandering L3 (72 h after infestation), most hemocytes in the tumors are of LG origin. 3) We analyze the resident hemocytes during development and upon infestation. Hemocytes home to the sessile compartment during larval development and are rapidly mobilized upon wasp infestation. We present these data in Figure 9A-D. In physiological conditions, the circulating hemocytes start homing and localize sub-epidermally by L2. This process continues until late L3, when the population of resident hemocytes becomes very prominent and stereotyped. Upon wasp infestation, the resident compartment is already disrupted by early L3 (30 h after infestation), with many hemocytes being in circulation. The early phenotype of the embryonic hemocytes is in line with the lineage tracing and the melanotic tumor data mentioned above. To summarize, the embryonic hemocytes represent an early, maybe the earliest, cellular target of wasp infestation and are responsible for the initial formation of tumors. The LG is involved at later stages. We summarize these phenotypes in a new schematic (Figure 10). 4) We analyze the impact of Gcm. Quantitative analyses of the infestation assays require standardization of several parameters: number of flies/wasps, number of wasp eggs/fly larva, temperature, length of infestation time. For this reason, the role of Gcm in the immune response was assessed in a genetic approach using gcm KD flies in which the JAK/STAT pathway is over-activated. We present these data in Figure 3G-K. See also the response to point 3.
a) Silencing Gcm accelerates LG histolysis. hopTum wandering L3 animals with or without gcm show an equally strong LG phenotype, we hence hypothesized that down-regulating Gcm triggers a precocious defect. Indeed, hopTum LGs histolyze significantly earlier, before the wandering stage, when gcm is down-regulated. 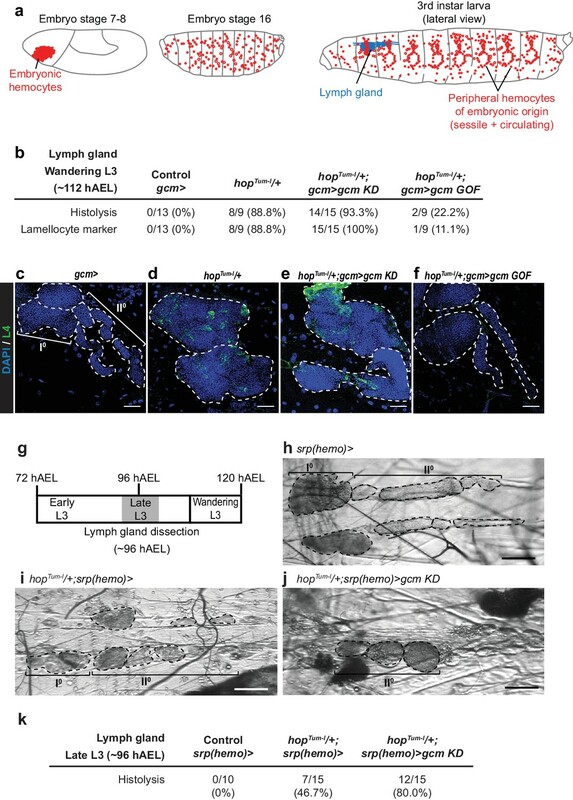 b) Gcm positively controls hemocyte sub-epidermal localization. i) The proportion of circulating vs. resident hemocytes increases in animals that are gcm> hopTum, gcm KD compared to that found in gcm> hopTum animals. Hence, Gcm helps the correct localization of the embryonic hemocytes (Figure 5C, 3rd and 4th columns). This finding is in line with the reduced expression of Eater in embryonic gcm KD hemocytes (Figure 1F, left panel). Eater is necessary for hemocytes to localize in the sessile compartment (Bretscher, Honti et al., 2015). ii) Gcm likely affects the hemocytes non-autonomously as well. The levels of edin transcripts increase in the fat body of gcm KD animals (Author response image 1, right panel). Edin codes for a secreted molecule that mobilizes the sessile hemocytes (Vanha-aho, Anderl et al., 2015). Thus, the embryonic hemocytes likely signal (directly or indirectly) to the fat body, although not through the JAK/STAT pathway (see below). We propose this hypothesis in the Discussion. In sum, the embryonic hemocytes play a major role in the immune response, which also requires the function of and the interaction with other cells and tissues. Gcm affects both the localization of the embryonic hemocytes (directly/indirectly) and the LG (indirectly). The future challenge will be to dissect the complex molecular cascade controlling tissue homeostasis. 3) The notion that gcm suppresses JAKSTAT pathway, which normally activates the expression of pro-inflammatory cytokines that signal the LG is well supported, but it is important to know what relays the triggering role of gcm at embryogenesis to a process that lasts up to late L3? The persistence of this phenomenon remains unexplored. Is the role of GCM to prevent a state of chronic inflammation by the JAK/SYAY pathway? Could the authors directly test this somehow, perhaps by determining the status of JAKSTAT activation across stages in Hop activated| mutants with or without gcmKD? 1) Gcm induces the expression of JAK/STAT inhibitors in the embryo and in S2 cells (Figure 2E, F). 2) The JAK/STAT pathway can activate the expression of the pro-inflammatory cytokines Upd2/3 in S2 cells (Figure 4G). 3) Gcm inhibits the expression of those cytokines in S2 cells and in the larval hemocytes (Figure 4E-G). These data suggest that Upd2 and Upd3 can relay the triggering role of Gcm, as also confirmed by the LG and tumor phenotypes of animals over-expressing any of the cytokines in the embryonic hemocytes. At this point, we still missed the demonstration that JAK/STAT activation in the embryonic hemocytes results in high levels of upd2 and upd3 expression in the hemocytes at the larval stage. 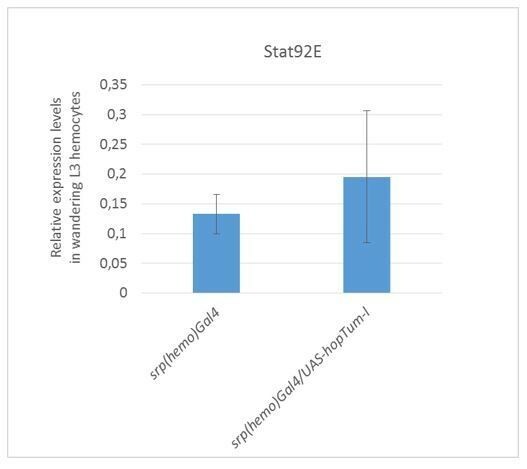 4) We filled the gap and showed that the over-expression of the JAK/STAT pathway in the embryonic hemocytes (srp(hemo)> hopTum) leads to increased expression of upd2 and upd3 in those cells at the larval stage (qRT-PCR assays). This validates the hypothesis that JAK/STAT activation cell-autonomously induces the expression of the cytokines and that this is still detectable in L3 hemocytes, well after the pathway has been over-activated. To please the reviewer(s), for these new data we used the srp(hemo) driver. We present these data in Figure 5—figure supplement 1J-K.
5) We extended the data on the non-autonomous role of the JAK/STAT pathway. We analyzed the levels as well as the nuclear localization of the STAT protein in the muscles of srp(hemo)> hopTum larvae. Nuclear STAT is generally associated with high STAT levels and indicates activation of the JAK/STAT pathway. Interestingly, overexpressing hopTum solely in the embryonic hemocytes enhances the overall levels of STAT in the larval muscles but not its nuclear localization. In addition, down-regulating gcm in those animals further enhances the overall levels of STAT and also results in STAT nuclear localization. We present these data in Figure 6. Of note, we see no activation of the JAK/STAT pathway in the fat body of the srp(hemo)hopTum larvae (see Author response image 2). Thus, the JAK/STAT pathway acts directly and indirectly on the immune response (Figure 11). 6) JAK/STAT activation in the somatic muscles is known to affect the immune response to wasp infestation (Dan Hultmark and collaborators, Yang et al., 2015), a phenotype that involves the lymph gland. We agree with the reviewers that the role of Gcm is to prevent a state of chronic inflammation by the JAK/STAT pathway. Altogether, our data indicate that the main role of Gcm is to sensitize the embryonic hemocytes and to enhance their response to an immune challenge (hopTum activation, wasp infestation). Gcm inhibits the expression of pro-inflammatory cytokines in the embryonic hemocytes, these cytokines then talk to the muscles, which accelerates LG histolysis. 7) Due to known auto and cross-regulation of the JAK/STAT pathway with other pathways, the levels of upd2/3 remain high even after gcm expression fades away (Figure 4E-F). (srp(hemo)> hopTum) larval hemocytes (Author response image 3). This may suggest that upd2 and upd3 expression becomes JAK/STAT independent in the 3rdinstar. These data are not included in the manuscript, which is already quite dense. We complied with the request on the figure. The discrete decrease of hemocyte number in gcm mutant embryos was published by Bernardoni et al. (1997). We complied with the request of the reviewer(s) and moved this figure to the supplementary material (Figure 1—figure supplement 4A-C’). We agree that phalloidin is not unique to lamellocytes, but we also used L4, a commonly used lamellocyte marker (Honti, Csordas et al., 2014, Anderl, Vesala et al., 2016). This panel shows that down-regulating gcm induces changes in blood cell specification. The expressivity of the phenotype is low, indicating that Gcm acts as a sensitizing rather than a pioneer (instructive) factor. It is also possible that some cells do not show the full phenotype but are on the go to become lamellocytes, as Hultmark and collaborators (Anderl, Vesala et al., 2016) identified hemocytes with different intermediate phenotypes in challenged conditions. We complied with the suggestions and improved the figures. We did not count the number of lamellocytes within the lobes of the LG because L4 immunolabelling is cytoplasmic and not nuclear. Individual cells in that case are not easy to identify. Moreover, we cannot compare the number of lamellocytes on histolyzed LG lobes, as this would lead to misinterpretation of the results. To that purpose, we relied on determining the percentage of L4 expressing lobes (LGs). Moreover, we did not count the number of circulating lamellocytes within the larvae where LG analysis was performed due to the fact that those larvae were selected and directly processed for LG dissections. It is not practical to count the total number of lamellocytes and perform LG analysis on the same larvae. On the other hand, we performed total hemocyte counts on other larvae that were not subjected to LG analysis, yet they are of the same genotype (Figure 1D, E; Figure 5—figure supplement 1D-F). Selected larvae were of the same age. We complied with the requests of the reviewer(s).Figure 1—figure supplement 3H, I has been removed and a higher mag is shown in Figure 8—figure supplement 1A’ and B’. 1) Lack of expression of the gcm Gal4 driver in the lymph gland. We used a gtrace approach to follow the driver over development and found no expression of the gcm Gal4 driver in the LG, this is shown in Figure 1—figure supplement B, B’. For comparison, note the efficient gtracing of gcm expression in the larval central nervous system (Figure 1—figure supplement 1D). The genotype of these flies is the following: gcm Gal4/UASFLP,UAS-RFP, Ubi-p63E(FRT.STOP)GFP (BDSC #28280). The lack of lymph gland expression was also published by the laboratory of L Waltzer (AvetRochex, Boyer et al., 2010). Those authors crossed the gcm Gal4 driver with a UAS FLP, Act FRT> CD2> FRT> GAL4 cassette and UAS-GFP reporter to make the gcm Gal4 driven expression of the GFP stable. 2) The observed phenotypes are not due to the glial driven expression of the gcm Gal4 line. We obtained comparable results upon using a gcm Gal4 repo Gal80 line that prevents expression in glial cells. This line is called gcm(hemo)> and the data are shown in Figure 5, Figure 1—figure supplement 4E. 3) We confirmed the gcm Gal4 data by using independent drivers specific for the embryonic hemocytes: srp(hemo) Gal4 and singed Gal4.These data are shown in Figure 1—figure supplement 4E. Figure 4A, D: These data are not convincing as numbers analyzed are low. The change in levels or lack thereof needs to be demonstrated by qRTPCR. In general a series of RTPCRs will rule out changes due to LG or glial expression. See above for the specificity of the driver. As per the qRT-PCR data, Figure 4E’, F shows the levels of upd2 and 3 transcripts in the larval hemocytes and these data are in line with those in Figure 4A. In Figure 4H: will gcm expression in fat body have the same effect on lymph gland? Or is it residual expression of gcmGAL4 in LG? How does the hemocyte signal to LG? Is it through fat body or the CNS? Expressing gcm in the fat body may create artificial phenotypes that could be hardly interpreted. For this reason, we did not perform the experiment. See above for the potential effects from LG/glia expression of the driver. See above for the hemocytes signaling to the muscle and to the fat body. 7) Figure 2: It would be more relevant to misexpress gcm in vivo in embryonic hemocytes and other tissues, rather than in S2 cells and evaluate pathway inhibitor expression as well as stat activation in the lymph gland. 1) We found that over-expressing gcm in the embryonic hemocytes lowers the expression levels of several targets of the JAK/STAT pathway in those cells. These data are presented in Figure 2H. Based on the literature, we analyzed the expression of apt, CG1572, CG13559, Galphaf and slbo. All these targets are less expressed in hemocytes that over-express gcm, confirming that Gcm inhibits the JAK/STAT pathway cell autonomously. We did not perform gain of function experiments in other tissues. Cell-specific cofactors necessary for Gcm activity may be absent there, rendering the interpretation of the results uneasy. 2) Concerning the impact of Gcm on the JAK/STAT pathway in the LG, we clarified this issue in the manuscript.The phenotypes observed upon down-regulating gcm in JAK/STAT over-expressing or infested animals (the formation of tumors, the depletion of the sessile compartments, the histolysis of the lymph gland) may or may not involve JAK/STAT activation in the LG. This is in line with the data from Hultmark and collaborators showing that wasp infestation triggers JAK/STAT activation in the muscle but not in the LG (Yang, Kronhamn et al., 2015). Published work calls for the role of the JAK/STAT pathway in the LG being complex and suggests that wasp infestation actually inhibits that pathway (Letourneau, Lapraz et al., 2016). Our overall goal is to show that the two hematopoietic waves communicate and that this involves a transcription factor expressed specifically in the embryonic hemocytes. Also, for Figure 2E, F: Without molecular and biochemical analysis it is not possible to comment on GCM transcriptional effect being direct. Also the reduction is significant only for socs. The text should be edited appropriately or additional evidence provided. Figure 2E, F show the effect of Gcm transfection in S2 cells and those of gcm down-regulation in embryonic sorted hemocytes.The expression of the three genes is significantly affected by manipulating the expression levels of Gcm in the two assays. This is in line with the similar phenotypes observed in vivo upon KD of any of the three genes (Figure 2G). We cannot formally exclude an indirect effect, hence we complied with the request and edited the text accordingly. Nevertheless, we previously published that all these genes appear in the Gcm-DAM ID screen aimed at identifying the direct targets of Gcm (Cattenoz, Popkova et al., 2016). Not only do they contain Gcm-DAM ID peaks but also carry Gcm binding sites at their loci. All the other targets identified in the screen were found to be directly regulated by Gcm upon mutagenesis of the Gcm binding sites. Therefore, we are quite confident that is also the case for the JAK/STAT inhibitors. We thank E Sonmez, A Bogomolova, A Pavlidaki and the Imaging Center of the IGBMC for technical assistance, A Bagul for reading the manuscript. We thank I Ando, WJ Lee and D Montell for providing us with antibodies and K Bruckner, M Crozatier, BA Edgar, M Meister, N Perrimon and MP Zeidler for providing fly stocks. In addition, stocks obtained from the Bloomington Drosophila Stock Center (NIH P40OD018537) as well as antibodies obtained from the Developmental Studies Hybridoma Bank were used in this study. This work was supported by INSERM, CNRS, UDS, Ligue Régionale contre le Cancer, Hôpital de Strasbourg, ARC and ANR grants. P Cattenoz was funded by the ANR and by the ARSEP, W Bazzi by the USIAS and by the FRM (FDT20160435111), V Dasari by COFUND, Y Yuasa by the USIAS and R. Sakr by the ARSEP. This study was supported by the grant ANR-10-LABX-0030-INRT, a French State fund managed by the Agence Nationale de la Recherche under the frame program Investissements d’Avenir ANR-10-IDEX-0002-02. © 2018, Bazzi et al.